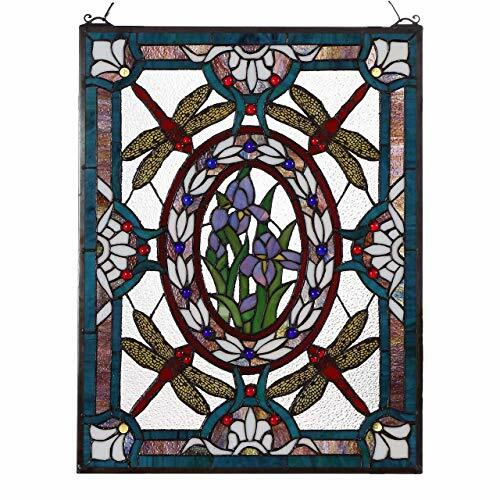 Expanding from a centerpiece of sparkling irises, rings of lilies and dragonflies encircle this over-two-foot-high, Victorian-style window. With precision, each piece of high-quality art glass is hand-cut, copper-foiled, and individually soldered, taking three full days to create. Scroll bracket and chain included for window hanging. This is authentic, hand-crafted art glass; variations of texture and color are part of the process. 19"Wx25"H. 6 lbs. 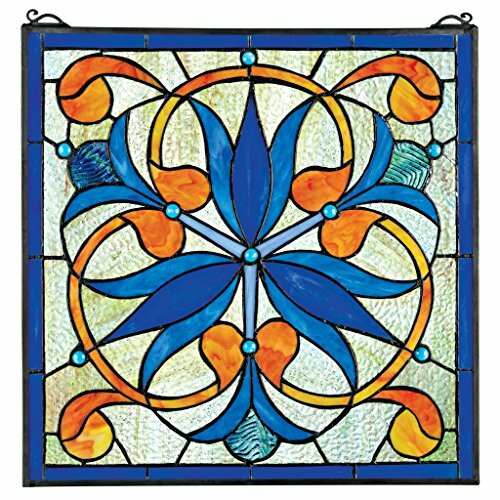 Stylized blooms of royal blue orchid flowers punctuated with a bounty of leaves sparkles in this stunning, 17"-square window. 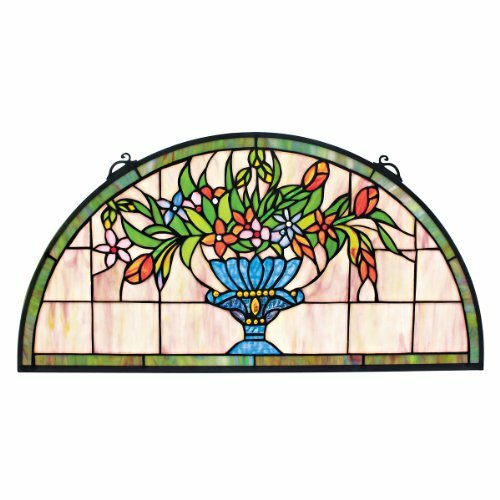 With precision, each piece of high quality art glass is hand-cut, copper foiled, and individually soldered, taking three full days to create this design Toscano exclusive. Scroll bracket and chain included for window hanging. Due to the hand-crafted nature, colors may vary slightly. 17"Wx17"H. 4 lbs. 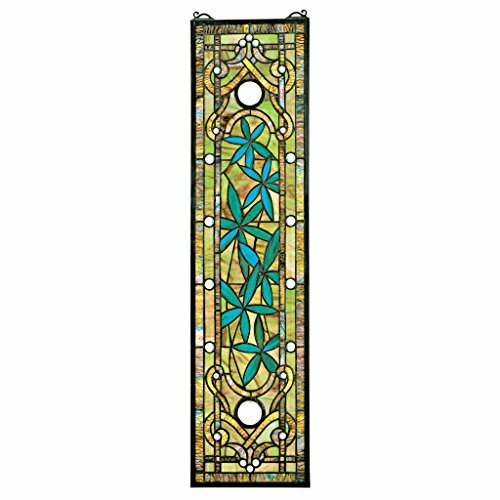 In a richly ornamental beaux arts design, this vertical, almost two-foot-long stained glass window pays homage to the classic tiffany style. Each individually hand-cut piece of art glass and cabochon is copper-foiled and encased in glazier's lead by a skilled basil street artisan. Display it within a window frame using the scrolled bracket included for hanging. This is authentic, hand-crafted art glass; variations of texture and color are part of the process. 7"Wx21&Frac12;"H. 2 lbs. Many stories of kindness surround the life of St. Francis of Assisi, patron saint of animals. 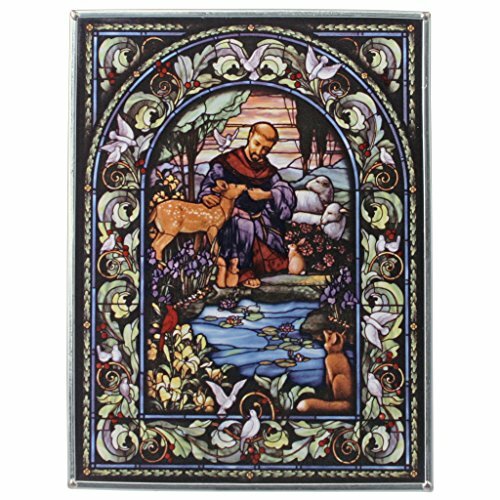 His love for animals is evident in this art glass rendered in the style of an antique icon framed with nature and a flock of peaceful doves. St. Francis arranged the first nativity scene and is now represented everywhere as the protector and caretaker for all animals. 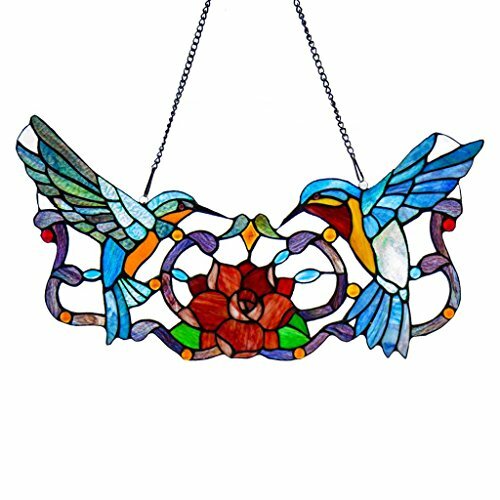 Art glass, also called stained glass, is created by a unique technique of fusing hand-rolled architectural glass with unique transparent enamels, then kiln fired at temperatures above 1100 degrees Fahrenheit so the colors actually becomes part of the glass. The shades and hues will stay bright and glowing with radiant color and provide a stunning view from either side. Our Design Toscana art glass window is framed in zinc with a hanging chain for window display and a tabletop easel stand to enjoy this treasured piece in any room. 7"Wx9"H. 1 lb. 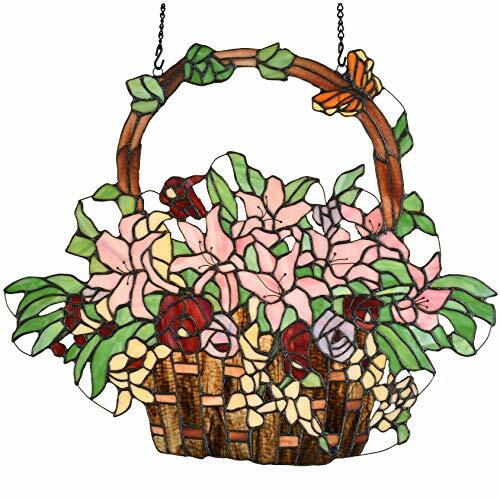 This is a gorgeous basket of Lily flowers window panel which was made of stained glass, it's perfect for decorating your room. 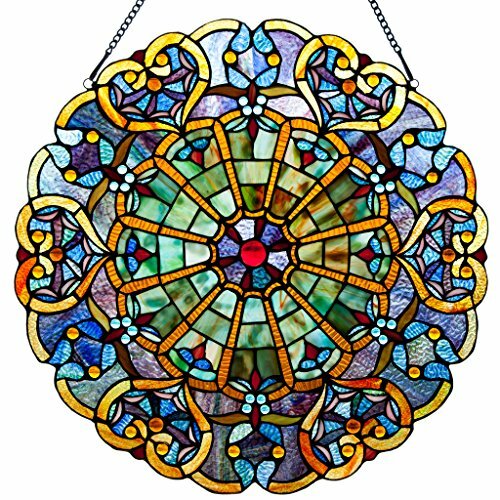 More than 150 individually hand-cut pieces of art glass and 4 cabochons encased in glazier's lead. 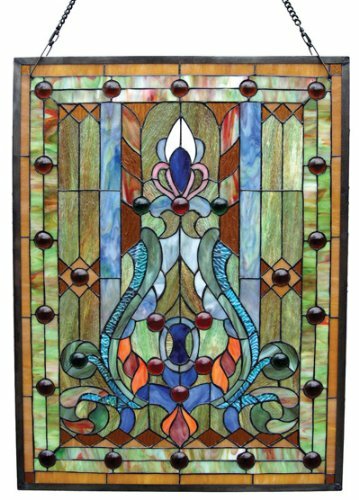 A sophisticated Arts and Crafts palette entwines organic elements with boldly contrasted angles that sparkle in a stunning, 17"-square window. 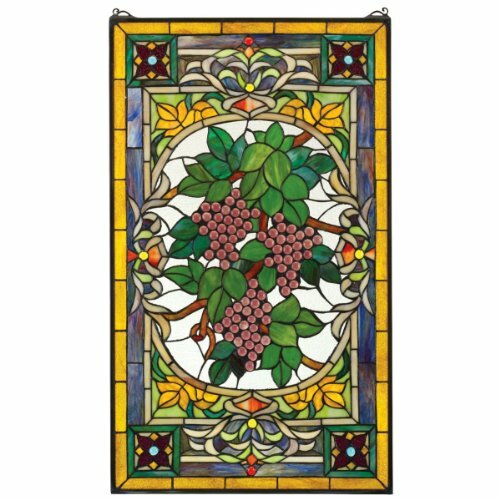 With an artisan's precision, each distinct piece of high quality art glass is hand-cut, copper foiled, and individually soldered, taking three full days to create this Design Toscana exclusive. Scroll brackets and chains included for window hanging. This is authentic, hand-crafted art glass; variations of texture and color are part of the process. 17"sq. 4 lbs. Includes hanging chain and hooks. 800 pieces glass cut. 152 beads. Indoor setting. Made from glass, metal and copper. Dark antique bronze finish. No assembly required. 20 in. W x 32 in. H (11 lbs.). 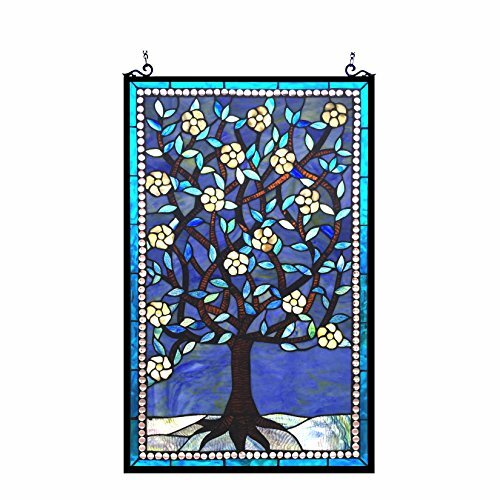 This hand crafted tiffany style tree of life design widow panel will brighten up any room. The beautiful blue will add color and beauty to any setting. 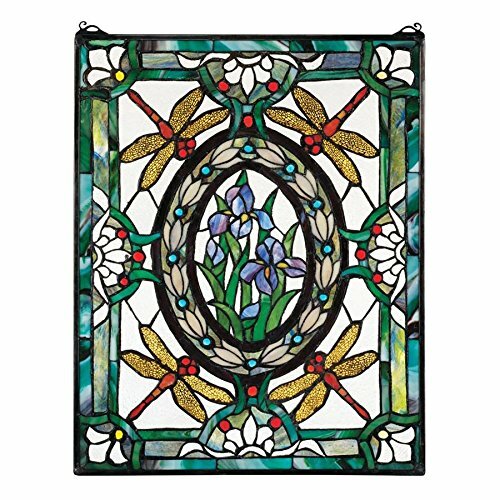 This is a gorgeous basket of forget-me-not flowers window panel which was made of stained glass, it's perfect for decorating your room. The alpine forget-me-not is the county flower of Westmorland in the United Kingdom and the state flower of Alaska in the United States. It grows well throughout Alaska in open, rocky places high in the mountains, flowering in midsummer. It is also found throughout the Himalaya range at elevations of 3,000-4,300 metres (9,800-14,100 ft). 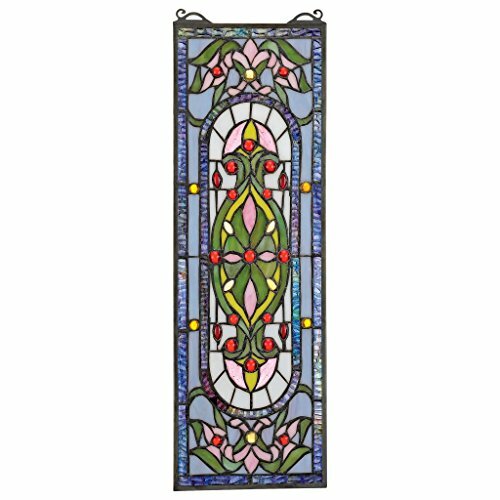 This Tiffany-style Window Panel has 19 inches wide lamp shade which was made of high quality stained glass, it is very suitable for decorating room, the beautiful glass-work on this Tiffany lamp is simply unrivaled. Wherever it is used, it is simply amazing. this lamp is great artistic piece that speak to the soul. If you have an aesthetic appreciation and likes to add something beautiful in your home, then you will always find a place in your home where you can incorporate this Tiffany lamp. 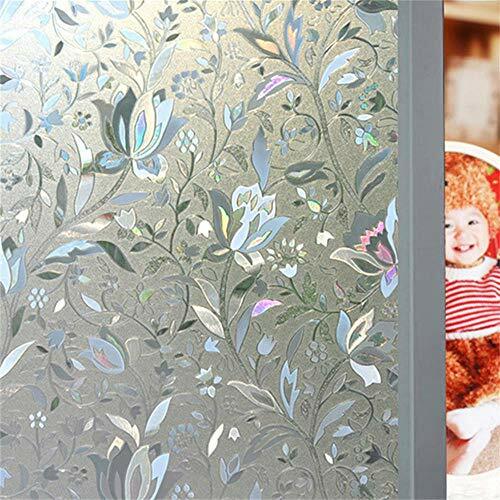 Welcome the brilliant translucence of an Asian garden to add sparkle to your window! 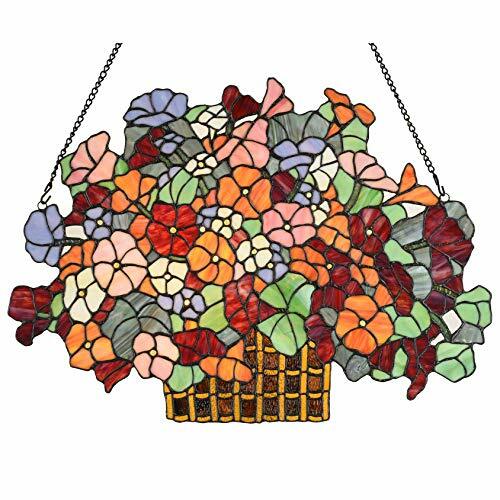 A half dozen exotic flowers meander up this unique vertical work of stained glass art that our Basil Street craftsmen have created with a multicolored palette sure to brighten even the most ordinary day. With precision, each piece of high-quality art glass is hand-cut, copper-foiled and individually soldered, taking 3 full days to create. Scroll bracket and chain included for window hanging. This is authentic, hand-crafted art glass; variations of texture and color are part of the process. 9"Wx35"H. 4 lbs. 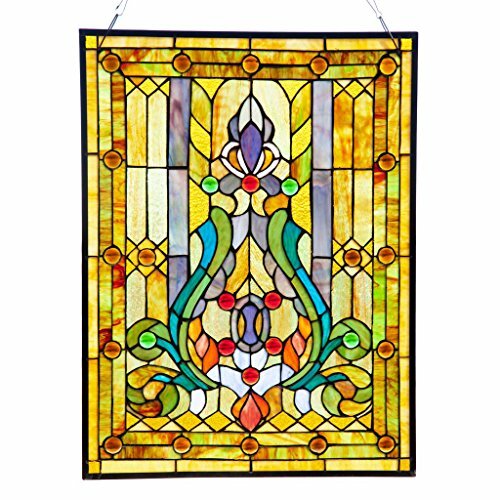 TF10112 Features: -Glass Window.-Stained glass.-Each piece of high-quality art glass is hand-cut, copper-foiled and individually soldered.-Hand-cut art glass encased in glaziers lead. Includes: -Scroll bracket and chain included for window hanging. Color/Finish: -Variations of texture and color are part of the process. 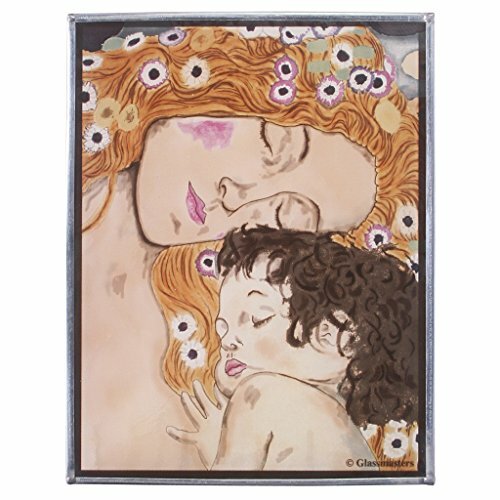 Dimensions: -Dimensions: 24" W x 0.5" D x 12" H.
A detail of acclaimed artist Gustav Klimt's highly stylized famous painting, "The Three Ages of Women" this art glass highlights the sweetness and love between a mother and a child while reproducing the rich depth of color, shading, and elaborate composition representative of all Klimt's work. 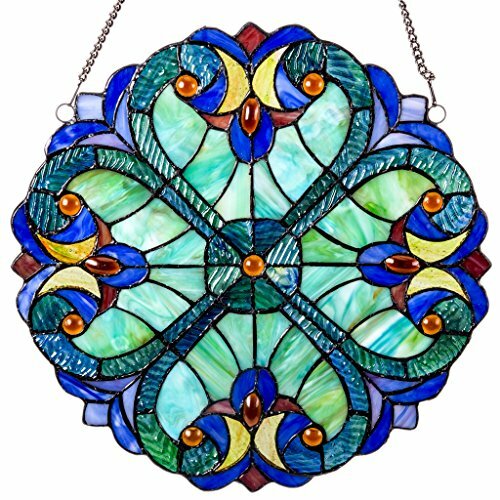 Art glass, also called stained glass, is created by a unique technique of fusing hand-rolled architectural glass with unique transparent enamels, then kiln fired at temperatures above 1100 degrees Fahrenheit so the colors actually becomes part of the glass. The shades and hues will stay bright and glowing with radiant color and provide a stunning view from either side. Our Design Toscana Art Glass window is framed in zinc with a hanging chain for window display and a tabletop easel stand to enjoy this treasured piece in any room. 7"Wx9"H. 1 lb. A charming picture! These adorable hummingbirds are sharing a sip of nectar as they flutter over a brilliant rose blossom. Their vibrant blue and yellow bodies contrast perfectly with the deep flower. This pieces is hand crafted from 162 glass cuts and 15 cabochons to bring an image of beauty and bliss. Glass Panels are a wonderful way to brighten up a room. 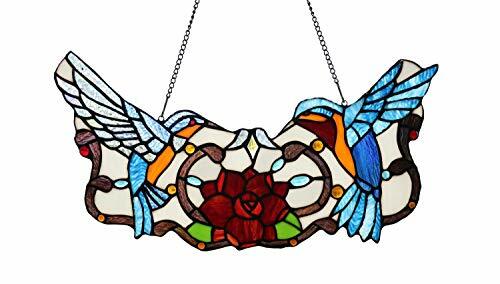 Easily hang from a window and let the sun shine in! 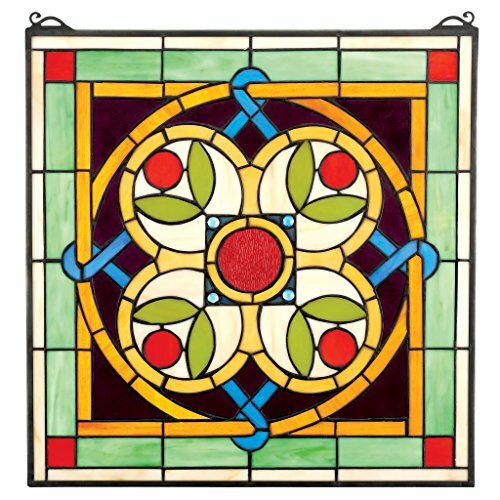 Compare prices on Floral Stained Glass Panel at LiveSaler.com – use promo codes and coupons for best offers and deals. We work hard to get you amazing deals and collect all avail hot offers online and represent it in one place for the customers. Now our visitors can leverage benefits of big brands and heavy discounts available for that day and for famous brands. We try to makes comparison shopping easy with Product Reviews, Merchant Ratings, Deal Alerts & Coupons. Find Deals, Compare Prices, Read Reviews & Save Money.